Worthy of its name, the american bantam, built on a minuscule 75-iri. Wheelbase, ran up to 50 miles on a gallon of gas and could reach 60 mph when the accelerator pedal was floored (although keeping it to the floor was not advisable). But american motorists resolutely refused to think small, and the company is ultimately better remembered for designing and building the u.s. Armys first jeeps. Mighty mite the bantam was the handiwork of roy evans, a salesman for american austin, the nations smallest car. After bankruptcy was filed in 1934 he bought the butler, pa., factory for $5,000 cash. Evanss successor bantam was an improved austin seven with the engine made more powerful by a lengthened stroke, larger valves and a higher compression ratio. 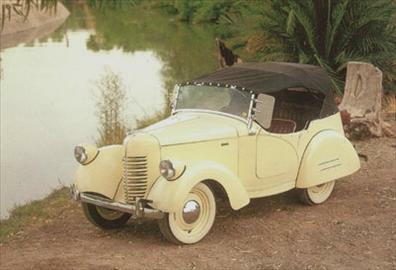 a better austin alexis de sakhnoffsky reshaped the austin fenders and headlights and designed a rounded grille. The frame was strengthened, safety glass was installed and the wheels were reduced in size. Body styles included a woodbodied station wagon, the boulevard roadster, the riviera convertible and the speedster phaeton, a four-passenger car with removable cloth top that was based on the roadster. About 2,000 speedsters were sold in 1939 and 1940. Built on a tiny 75-;?. Wheelbase, the american bantam speedster was a cute four-passenger minicar with a removable cloth top.